Dessa's Deadly DIY: Watch party edition! Are you already counting down until season 8 returns? Do you want to celebrate the Walking Dead? How about we help you sett up for the BEST watch party the lucky people you call friends have ever seen? Well follow me. The upcoming weeks I will help you get mouthwatering snacks, tasty drinks, awesome decorations and unforgettable games! Welcome back! We are counting down to the return of Season 8 on the 25th of february! The best way to get right back into the action is with friends. And while you're at it, get food, drinks, games and some decoration to make this a memorable gettogether! I will get you all the information you need to throw an awesome party. In this second edition we will go through some walker themed sweetness you can serve. So, once again, get yourself to the kitchen. 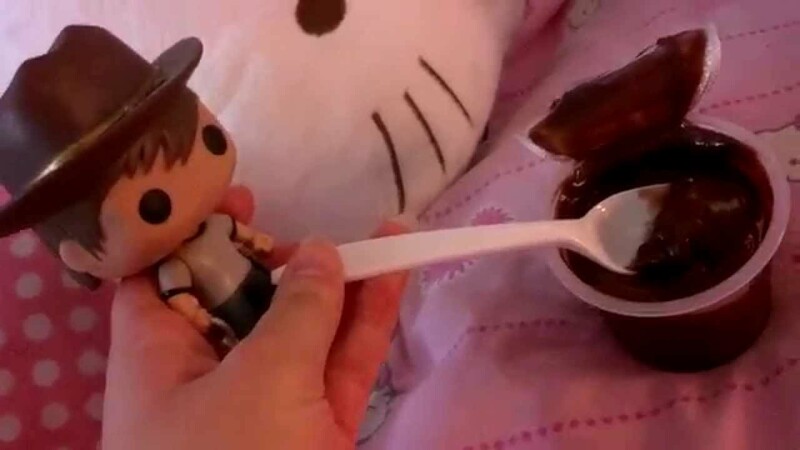 Okay we all agree, one of the most memorable desserts in the show is chocolate pudding. Carl noms it and we love it too. But there is a difference between buying pudding cups and making the real deal from scratch. Both are fine, so if you're a lazy fucker host you can buy pudding cups. Making chocolate pudding is super easy. You can even buy those boxes that you mix with whole milk on a stove. Which tastes just fine, like the pudding cups it's a fast and easy fix. But making it from scratch..oh boy... it's heaven! -In a medium sized pot combine sugar, chocolate powder, cornstarch, salt and coffee powder (optional). Whisk together. -Gradually pour in milk (along with the half and half), whisking it in. Turn stove on medium heat and bring the mixture to a boil, stirring constantly. Boil for one minute then remove from heat. -Now whisk in butter and vanilla, continue to whisk for a couple minutes while the pudding cools. -Serve warm if you like or transfer to a bowl to chill. Press the plastic wrap directly onto the pudding to avoid a hard layer or "skin" on top of the pudding. Easy huh! And it's so good! You probably will need to make extra just to make sure. Sure we already have that awesome brain cheeseball, but at a The Walking Dead party there can never be too many brainlooking noms. So I'll show you how to decorate your freshly baked cupcakes. Just bake them the way you like of follow the instructions on the box. "Go, Go, I'll wait till they're done and cooled off!" Now you got cooled off cupcakes right? Now we need to get frosting. Add the sticks of softened butter, vanilla extract and milk. Start your mixer (or beaters) on the lowest setting. I usually put a clean dishtowel around my mixer to keep the sugar from flying out. Keep on low until the butter and sugar are incorporated and then kick your mixer up to medium high. Once fully incorporated, after a minute or so, stop the mixer and check the consistency and taste. At this point your frosting may be a little dry. Add a little bit of milk, mix and check again. Now add your pink food colouring and mix it in until you got a smooth frosting with an even colour. So we got chocolate, cupcakes and we certainly need cookies too. These look so cute. Just wait and see! *You can use a piping bag fitted with a round nozzle but a bottle is a little bit easier. 1.To make the cookies, either in an electric stand mixer or a large bowl with an electric hand whisk, cream together the butter, sugar & vanilla extract until light and fluffy. 2.Add the egg and beat again until it’s all combined. Tip in the flour and beat with a wooden spoon until it clumps together to form a dough. 3.Tip out onto a work surface and knead gently to bring together into a ball. Divide it into two, then roll each one in-between 2 large sheets of baking paper to 6mm/1/4″ thick. 4.Place both into the fridge to chill for about an hour. This is important as if you don’t chill the dough, when you cut out the cookies they won’t hold their shape well. 5.Once the dough is chilled, remove from the fridge and cut as many 7cm circles out as you can. Re-roll the leftover dough to the same thickness & cut more cookies until all the dough is used up. 6. Chill the cookies for 15 minutes whilst you preheat the oven to 190°C/Fan 180°C. Bake them for 10 minutes until the edges are turning golden. I turn the tray round halfway to ensure an even bake. 1.In an electric stand mixer or a large bowl with electric hand whisks, beat together the egg whites, icing sugar & lemon juice on high speed for about 5 minutes until stiff peaks form. 2.Adding no more than a drop or two at a time, very gradually add cold water and mix in-between each addition until it’s thinned to soft peaks. 3.Take 3-4 heaped tablespoons of the icing and place into a bowl. Immediately cover with cling film and set to one side. This will be used to pipe a border around each cookie to hold the icing in. 4.Back to the mixer. Once again, adding a little at a time, very gradually add cold water and mix in-between each addition until the mixture becomes a flooding consistency. Take 5 – 6 tablespoons of the icing and place into a small bowl. Colour with red food colouring gel then immediately cover with cling film. Set to one side. 5.Pour the remaining icing into another bowl, immediately cover with cling film & set to one side with the others. And now on to the fun part. The decorating! On to the decoration! Once the cookies have completely cooled, load a piping bag with the writing nozzle. Give the border (soft peak) icing a good mix then spoon into the piping bag. Carefully pipe round the edges of each cookie and leave to set for 15 – 20 minutes. When the icing has finally set, we’re ready for the really fun bit! It’s probably a wise idea to tape newspaper up the back of where you will be ‘spattering’ and also to place underneath the biscuits you are decorating. I opted to decorate 3 – 4 at a time (mainly because I wanted to enjoy this bit for as long as possible!) but you could just as easily decorate all of them at once. It’s entirely up to you. So this was your weekly fix of Dessa's Deadly DIY. Next week we head into the kitchen one last time, cause a good host always get's his/her guests refreshments. Lilja Valdis Who making me food? Adam Vimear Wow, Dessa, these recipes look absolutely amazing!